Prehistory: Archaeological evidence indicates that ancestors of modern humans occupied sites in Central and East Java as early as 1.9 million years ago; presumably, these hominids were widely distributed in other areas. Fossils were found in 2003 of a tiny species of ancient hominid (homo floresiensis) that lived up until at least 18,000 years ago on the island of Flores in the Lesser Sunda Islands. There is evidence of modern humans as early as about 40,000 years ago, but they may have been present much earlier. By about 5,000 years ago, the circulation of peoples within the archipelago and the absorption of influences from outside had begun to create a diverse but related complex of cultures often identified as Austronesian. What is today Indonesia lay at or near the center of this complex, which eventually spread east throughout the Pacific, and west as far as Madagascar. Early History: Although Indonesian peoples clearly had contact with the outside world at an early date (cloves, found only in Maluku, had made their way to the Middle East as early as 4,000 years ago), physical evidence in the archipelago is much later. Sites containing Indian trade goods now date at about 400 B.C., and the first inscriptions (in eastern Kalimantan and West Java) at about 375–400 B.C. The first formal kingdoms of which we have extensive knowledge are Srivijaya (flourished c. A.D. 550–c. 1050), a Buddhist trading polity whose power was centered in the region of present-day Palembang and reached to coastal areas on the Malaysian peninsula and elsewhere, and Mataram, in Central Java, where magnificent Buddhist and Hindu monuments such as Borobudur and Prambanan were constructed in the eighth and ninth centuries. The greatest of the subsequent Hindu-Buddhist states, the empire of Majapahit centered in East Java, claimed hegemony from the late thirteenth to early sixteenth centuries over a wide trading region stretching from Sumatra to Maluku. Islam entered the archipelago in about the eleventh century, but significant conversions did not take place for two centuries or more, beginning with Pasai (North Sumatra) at the turn of the fourteenth century and going on to Makasar and Central Java in the seventeenth century. Contacts from China deepened between the tenth and fourteenth centuries as a result of growing trade, but Mongol attempts to control Javanese power (in the late thirteenth century) failed, and early Ming dynasty (1368–1644) efforts to exercise great political and economic influence were fleeting. It was at this time also that Western visitors began appearing, starting with Marco Polo in the late thirteenth century and continuing with the Portuguese and Spanish in the sixteenth century. They were soon followed by the Dutch (1596) and the English (1601). Europeans affected trade and politics in specific places and periods, but for most of the archipelago beyond Java and parts of Maluku, colonial rule did not set in until the mid- or late nineteenth century. Colonial Period: Dutch power in the archipelago grew very gradually, and colonial rule was not a goal of the Dutch East India Company (VOC), which dominated trade from Amsterdam and, after the early seventeenth century, a fortified port called Batavia (now Jakarta) in West Java. But on Java local realities produced, by the mid-eighteenth century, a symbiotic Dutch-Javan relationship that survived the bankruptcy of the VOC in 1799 and soon took the shape of a colonial administration, which grew and consolidated during the late 1800s. In the first decades of the twentieth century, a modern Dutch colonial state extended its control to most of the area we now call Indonesia. Simultaneously, some of the peoples ruled by this state discovered nationalism; the first groups date from the early 1900s, and by the 1920s and 1930s an array of modern political organizations and leaders, including the well-known nationalist figure Sukarno (1901–70), came to the fore. The struggle between the Dutch colonial government and the Indonesian nationalist movement was well under way when the Japanese occupied the Indies in 1942. They remained until the end of World War II in August 1945. 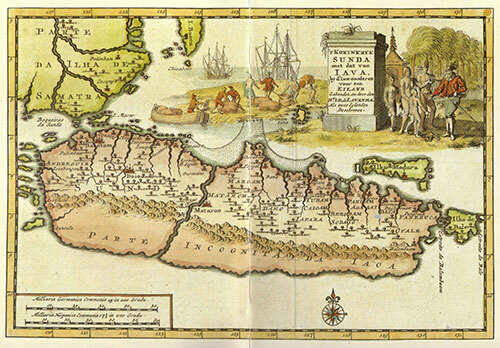 An early 18th century Dutch map from a time when only the north coastal ports of Java were well known to the Dutch. Independence Period: On August 17, 1945, Sukarno and Mohammad Hatta proclaimed the independent Republic of Indonesia with Sukarno as president and Hatta as vice president. Allied forces (mostly British and British Indian troops) did not arrive until six weeks later, by which time the republic had begun to establish itself and nationalist pride had burgeoned. The period October-December 1945 was filled with violent conflict in which Indonesians made it clear they would defend their independence with their lifeblood. Forcing the Dutch to negotiate with the republic for an end to hostilities, the British withdrew in late 1946. The republic subsequently survived two Dutch “police actions” and an internal communist rebellion, and on December 27, 1949, The Hague formally recognized the sovereignty of a federated Republic of the United States of Indonesia, which a year later was formed into a unitary Republic of Indonesia. Despite the holding of democratic elections in 1955, the years following the struggle for independence were characterized by political and economic difficulty: regional dissidence, attempted assassinations and coups d’état, military-civilian conflict, and economic stagnation. A period of Guided Democracy was announced in 1959 by Sukarno, who in September 1963 proclaimed himself president-for-life and presided over a political system in which the civilian nationalist leadership, much of the Islamic leadership, the large Indonesian Communist Party (PKI), and the army were all at odds. This tense and hostile atmosphere was broken on September 30, 1965, with what appears to have been an attempted PKI coup against the Sukarno government. The precise circumstances remain unclear, but the immediate result was that a “New Order” coalition of students, intellectuals, Muslims, and the army brought about a military-dominated government that removed Sukarno and permitted a broad and deadly assault on communists, especially on Java, Bali, and Sumatra. In late 1965 and early 1966, an estimated 500,000 Indonesian communists and suspected communists were killed and many more arrested. General Suharto was the second President of Indonesia, holding the office from 1967 to 1998. On March 11, 1966, power was transferred from a seriously ill Sukarno to a high-ranking army officer, Suharto; the PKI was formally banned the following day. Suharto became the acting president on March 12, 1967, and the New Order era began. The New Order era, which lasted for more than 30 years, has a mixed record. Like Guided Democracy, it was authoritarian, but it was more successful in bringing stability to the nation. Unlike Guided Democracy, its economic achievements were enormous and the well-being of the majority of Indonesians undeniably improved. Average life expectancy, for example, increased from 46 to 65.5 years. On the other hand, the state’s heavy involvement in banking and industry, especially the petroleum and natural gas sectors, worked against competition and encouraged corruption on a large scale. Heavy-handed political control and propagandizing of a national ideology may have aided stability, but also did not prepare the nation for a modern political existence. A modernizing, educated, and better-off middle class grew, but gained little or no political clout; poverty was reduced, but some particularly severe pockets appeared to be intractable. Suharto provided strong leadership, but he did not provide for a wise transition and, in his last years, clung to power and favored family and friends. East Timor, which had been forcibly annexed to Indonesia in 1976, saw bitter conflict between the Indonesian military and local independence movements. When the Asian financial crisis hit in 1997–98, the New Order lost the economic justification that had guaranteed much of its public support, and there was a widespread call for Suharto to step down. He resigned on May 21, 1998, little more than two months after being selected for his seventh term as president. 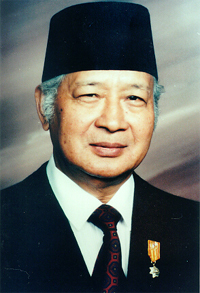 Suharto was succeeded by Bucharuddin Jusuf Habibie, who sought first to resolve the East Timor situation and begin a new and more open electoral process. In 1999, following Indonesia’s first freely contested parliamentary elections since 1955, Abdurrahman Wahid, well-known as both a progressive intellectual and as leader of Indonesia’s largest Muslim organization (Nahdlatul Ulama, NU) became president. His quirky and often uncompromising leadership style, and questions about both his competency and his health, brought him increasing opposition and eventually serious threats of impeachment. He was dismissed from office in July 2001 in favor of Megawati Sukarnoputri, his vice president and head of the Indonesian Democratic Party of Struggle (PDI-P). Megawati, Sukarno’s eldest daughter, was decisively defeated in the September 2004 presidential runoff election by the Democratic Party candidate, retired army general Susilo Bambang Yudhoyono. Yudhoyono was sworn in as president in October 2004. Map of Indonesia with administrative regions (provinces). Overview of the political history of Indonesia. Indonesian and West Papua (Irian Jaya) history. Wikipedia article about the History of Indonesia.